Black Tea is fully oxidized. It is the choice of 80% of American tea drinkers. Although green tea gets most of the publicity for health benefits, all tea, including black, is rich in antioxidants, and our U.S. palates, so used to over-roasted coffee, sodas, energy drinks and strong flavors, naturally seem to gravitate to black tea..especially iced..which again is the choice over hot tea of about 80% of Americans. This is changing as quality, loose leaf tea options grow in the marketplace and people want to expand their beverage horizons, but we don’t think black tea will be dethroned from its’ #1 position for any time soon. 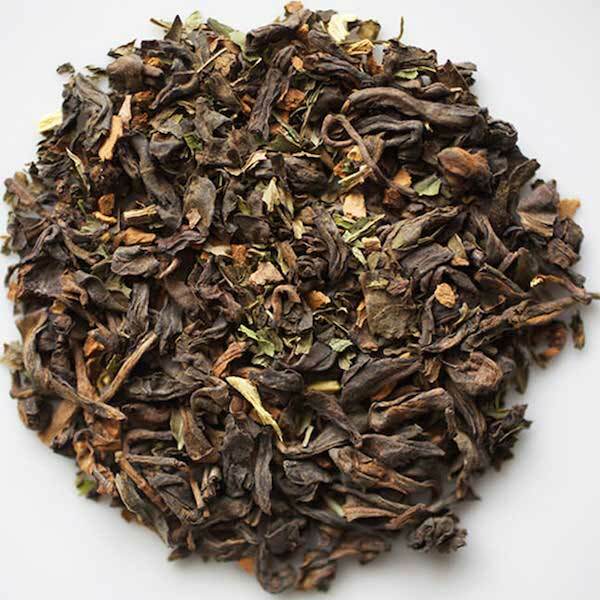 It just quenches the thirst and satisfies the need for a little ‘caffeine lift’ and tastes doggone great…especially our black tea…meticulously chosen from among the overwhelming options offered in the wholesale marketplace to retailers. Our black teas tend to be bold, straightforward and, especially if blends, amazingly full of flavor. We recommend all iced teas be brewed as recommended for the category in very strong infusions and immediately poured over a shaker of ice, shaken & enjoyed..for maximum flavor and antioxidants! Hot or iced, our black teas are fantastic! Brewing: We recommend our black teas be steeped in water 190-195F for 3-4 minutes, to taste. Two major tea growing regions in India are Assam and Darjeeling. 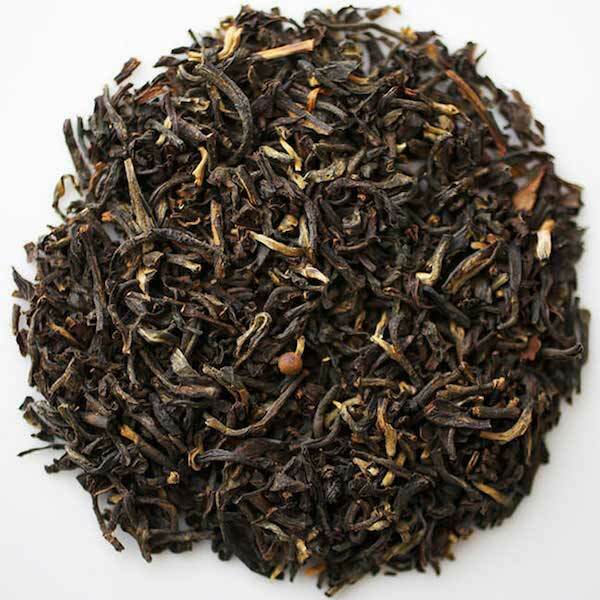 Assam conditions yield a bold, heavy, musty, earthy black tea that stands up to milk and sugar. We blend this with the Sri Lankan English Breakfast and a strong Chinese black tea for our Irish Breakfast, but alone it is just one powerful cuppa. Serving Suggestion: Serve strong and hot, alone or with milk and sugar. Ingredients: Black tea from India’s Assam region, sourced from a certified organic, Fair Trade supplier. **DECAF ASSAM AVAILABLE by custom order, same price, 1 lb. minimum, we pay shipping on 1 lb. or more. Order 16 oz. 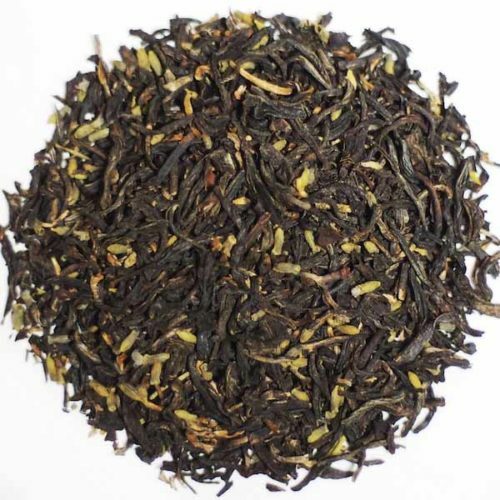 regular Assam and write ‘DECAF’ in PayPal Instructions to Seller, or email us at info@calteas.com for more information. Does having actual chunks of real peach in the blend tell you this is a black tea perfect for iced tea? Add a little sweetener or choice and the peach just pops! Peach & raspberry are the two best-selling iced teas around, but most in restaurants and fast food places are glunked with heavy syrups and/or lots of sugar. 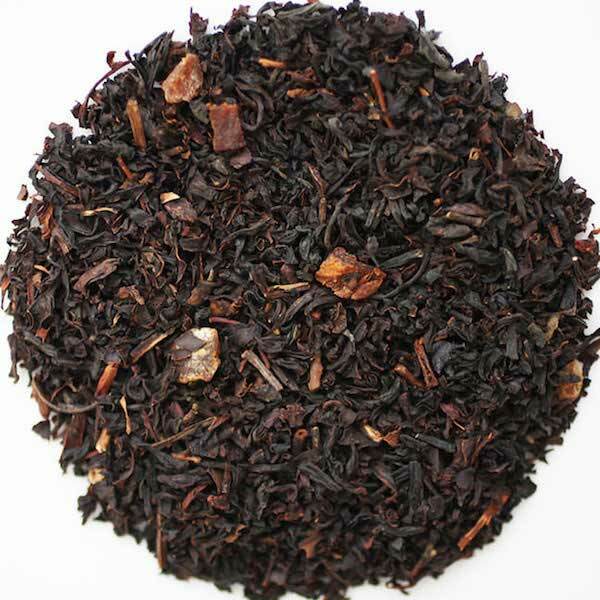 This quality, strong black tea gets its’ peachiness from the dried peaches but you can sweeten and intensify that natural peach flavor with raw sugar or honey, if you wish. Serving Suggestion: Serve hot, plain or with honey. Garnish iced California Peach with a sprig of fresh mint. Brewing Instructions: Use 1 heaping tsp. to 1 tbs. per 8 oz. water, to taste. Steep a good 4 minutes to bring out the peach at 190-195F If too strong for your palate, cut back to 3 minutes for a lighter taste. 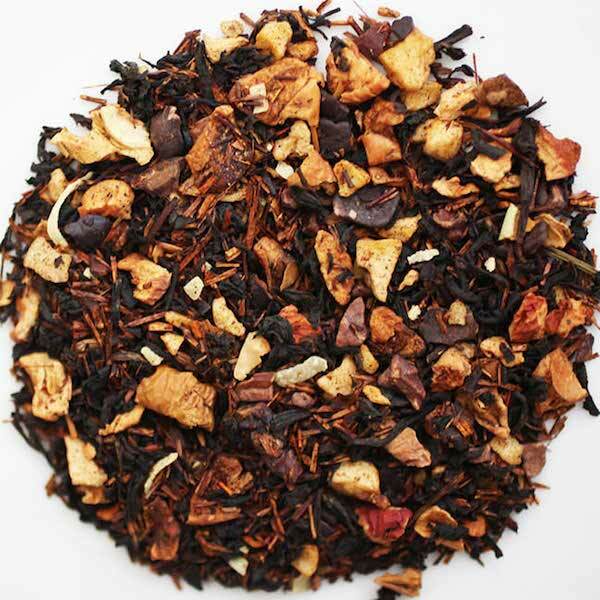 Ingredients: Nilgiri black tea, peach, rosehip, hibiscus, roasted chicory root, apple, natural peach flavor. 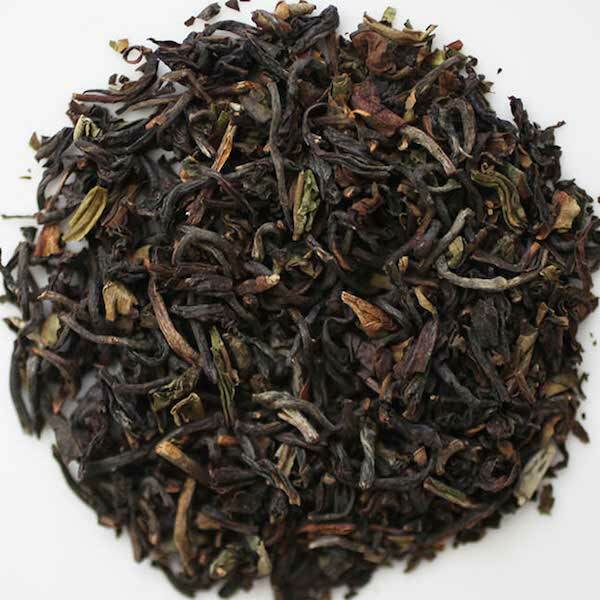 A bold black tea from the Yunnan region of China. From young trees, it is strong, complex and absolutely unique and delicious, with just a hint of puerh at the finish. It makes an excellent breakfast tea because of its’ ability to stand up to milk and sugar, if desired. 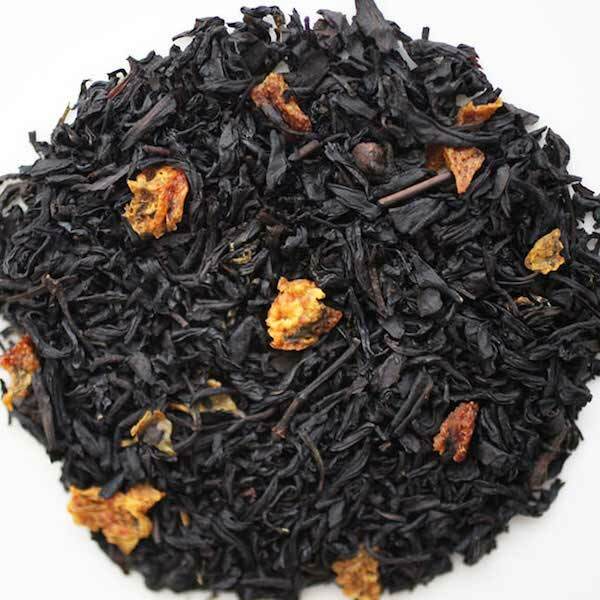 We love it stand-alone black, as a wonderful option to our other breakfast teas. Serving Suggestion: Serve as an excellent first cup of the morning, or as an afternoon pick-me-up. This is what some like to call a ‘dessert tea’. A really creative blend of black tea, Rooibos, cacao, chocolate, yogurt and toasted coconut. Yummy!! Serving Suggestion: Brew a heaping TBS in 5 oz. water and add to 7 oz. steamed milk. Add honey or dark chocolate sauce for a luscious latte. Add same 5 oz. strong ‘shot’ to hot chocolate. The Darjeeling region of India yields much gentler tea than Assam–lighter, nutty, with nuances accompanying each ‘flush’ or picking. As seasons pass, the infusion with each picking becomes bolder and yet retains the essence of why Darjeeling is known as ‘the champagne of tea‘..truly a delicacy even with later flushes, accompanying the perceptible earthiness of Indian teas. A toasty essence combines to give a lovely finish. 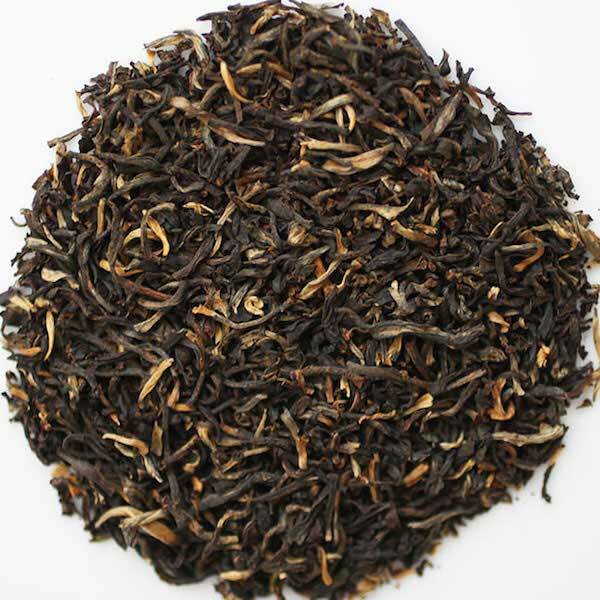 This is an autumnal flush Darjeeling. Serving Suggestion: Serve black or with milk & sweetener. There are tea people and then there are Earl Grey tea people (who are somewhat like chai people in that they are ever on the prowl for that special one). We are definitely in the second group..always looking for perfection. So, we finally decided to blend our own to get exactly what we were looking for. This is a smooth, fragrant, Earl Grey delight. We used two blends of Earl Grey we loved, each for their own qualities, and combined them in just the right ratio for a result that is the best of each, and completely lovely. This will make Earl Grey lovers very happy. Serving Suggestion: Makes lattes ‘to live for’ if you’re one of those Vanilla Earl Grey Latte types. Just make sure you use a really quality vanilla syrup. Brewing Instructions: Use 1 heaping tsp. to 1 tbs. per 8 oz. water, to taste. Steep 3-4 minutes (strong tea) at 190-195F. 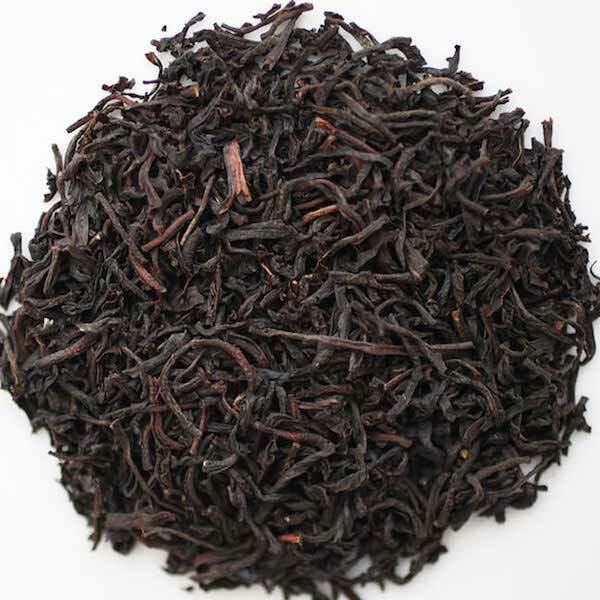 This is a great way to start the day: Sri Lankan black tea makes a wonderful classic breakfast tea, producing a clear, crisp, bright infusion, a great example of a perennial classic, English Breakfast. Serving Suggestion: Serving hot with milk and sugar, if desired. Serve iced for a clear, straightforward, refreshing iced tea. Ingredients: Black tea from Sri Lanka. 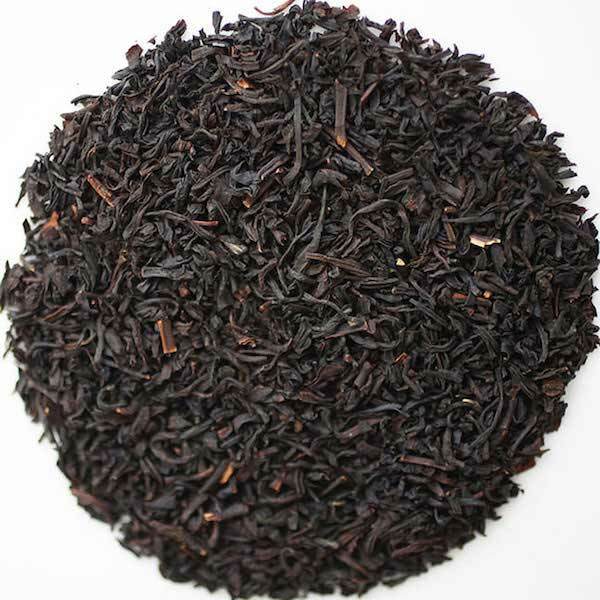 From the Yunnan Province of China, this is a premium ‘ancient tree’ black tea with dark infusion, rich, smooth flavor, and the ability to stand up to milk and sugar, or even cream and sugar. This is the perfect tea to make the transition from coffee to tea, for those desiring less caffeine in the mornings. The infusion of this tea is as black as coffee. Serving Suggestion: Serve hot and black. 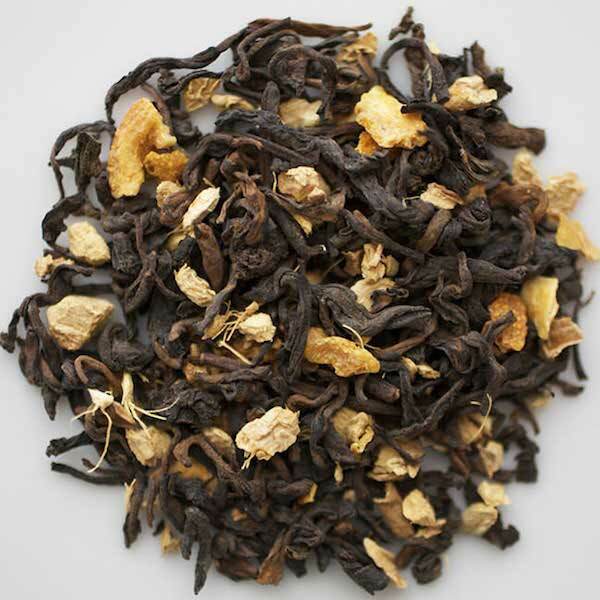 Ingredients: Yunnan black tea from ancient trees, sourced from a certified organic, Fair Trade supplier. Our own proprietary blend of three bold, black teas from three different countries, it is the perfect morning tea. A well-known tea blogger has said it’s the best Irish Breakfast she has ever found. This is all loose tea, not the usual CTC (cut-tear-curl) many blenders use for Irish Breakfast. Using loose tea gives it less ‘harshness’ but all the strength the blend is known for. Serving Suggestion: Enjoy it strong and black or with milk and sugar. Even cream and sugar. All teas in blend sourced from certified organic, Fair Trade suppliers. 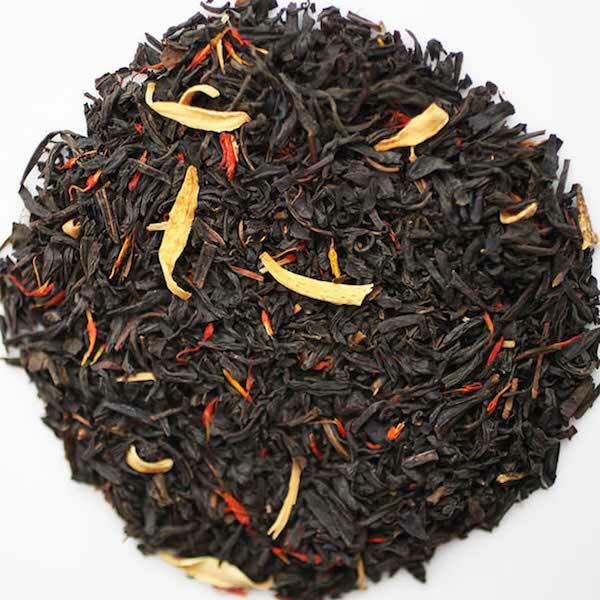 Mmmmm…a naturally sweet blend of black tea, citrus and spices. So flavorful, and perfect for anytime, not just the holidays! Keep it stored in a cool, dry place. Our supplier suggests it be refrigerated. Serving Suggestion: Serve hot with a slice of orange and cinnamon stick for garnish. Ingredients: Black tea with Orange Peel, Essential Orange Oil, Cinnamon Oil, and Orange Rind pieces. Loose pu-erh tea, generously blended with the bite of real ginger. Pu-erh is a unique category of tea. It is sometimes called ‘doubly fermented’. The fermentation of leaves following oxidation gives this organic tea unique properties and a very unique taste. It is smooth, rich and often has the ‘fermentation’ aspect to the flavor. Pu-erh can be loose or pressed into cakes. Some very old pu-erh cakes are as valuable as old wine. Serving Suggestion: Serve hot and strong. Ingredients: Pu-erh tea, real ginger bits. 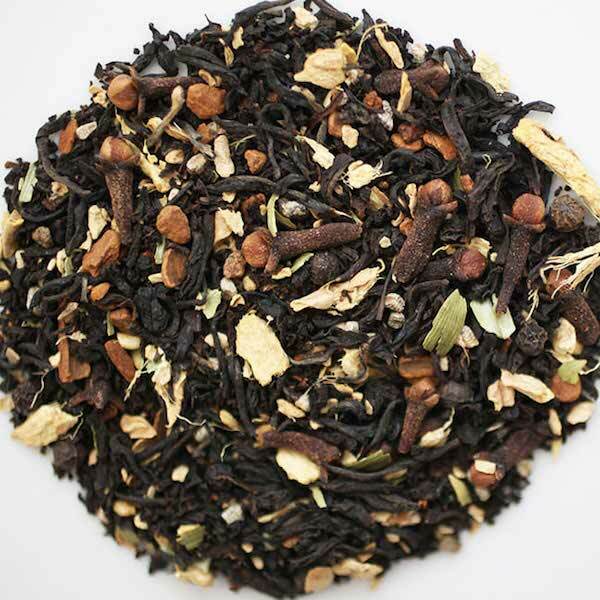 Strong, bold, spicy blend of Indian black tea and authentic Masala spices, perfect for the chai afficionado. This is not for the fainthearted or undecided. Very different than powdered or pulverized chais. Just look at it! Serving Suggestion: Serve strong and black, or double strength added to steamed milk and honey, for the perfect chai latte. 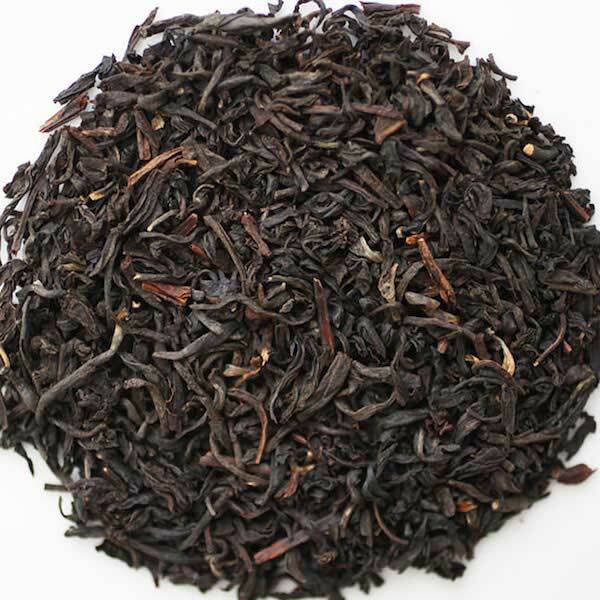 A quality black tea with lovely, fragrant, tropical notes. Simply put…amazing iced tea. On brewing, aroma envelops the area with scent of fragrant florals. Serving Suggestion: The perfect iced tea, served black or with raw sugar or honey. Pu-erh is smooth, so very smooth, and so rich. After it is oxidized, the leaves are fermented. Some call it double oxidation or double fermentation. It gives the tea special properties both in taste and benefits. 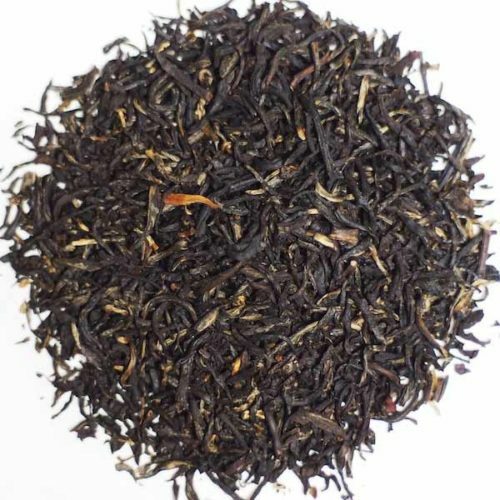 This amazing loose leaf pu-erh is mellowed with mint and vanilla, A perfect tea for coffee drinkers, with a rich, dark infusion, strong, smooth and complex.